Johnny Walker logo, (c) Diageo plc. This is a bit unfair to old JWB — he wants to just keep walking, but just as the old boy saunters past the once-garish, now-tatty hawker’s booth nestled in the seawall of Old Brighton, just west of the pier, out come a couple yobs wielding – wait for it – glencairn glasses. Frightening. You guessed it, we’re not just looking at old JW Black here, but comparing him to another Black and a simian. And even a single-malt. Which we gotta do as there are 1000 reviews of JWB around – we need some spice for this old pottage. 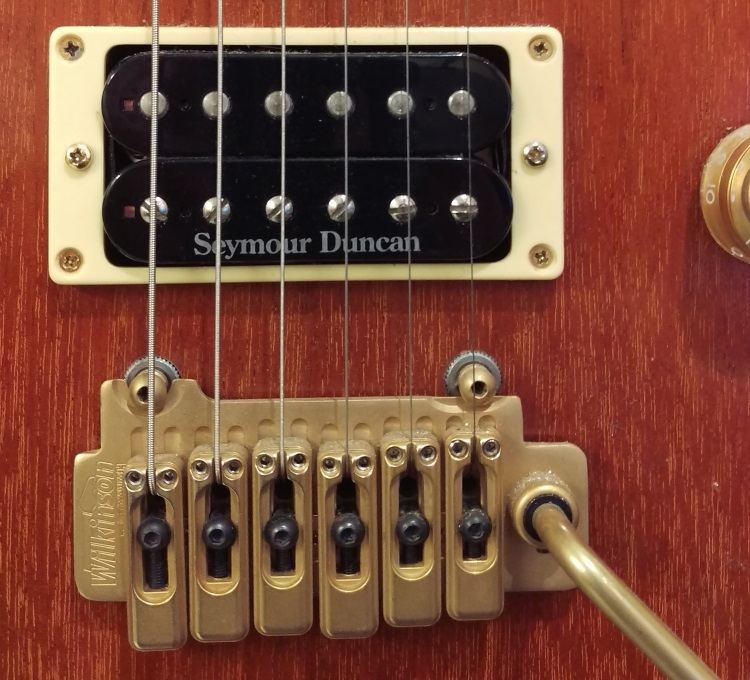 Seymour Duncan JB pickup, in situ. Johnnie Walker comes up a lot in my reviews of blends because I consider the Black a damn good whisky for the price. At $40 US (two Jacksons), you get a consistent product which has enough character to sip neat. And yet, do I buy it often? No, because like my wife and her cooking, I can’t leave well enough alone. I’m always trying new things, even when I’ve found something I like. Johnny Black is like a Seymour Duncan ‘JB’ guitar pickup – reliable in character, and although you know you’ll stray, it’s also known you’ll return home now and then to its comfortable familiarity. It even has a similar name, and costs about the same. Weird, huh? So, what’s in a JW Black? “About 40 whiskies” is a common quote and that compares well with Grant’s Reserve blend, with 43. I am staggered it would take 40 whiskies to make a blend, but I imagine that’s so they can adjust the components when one or the other are more or less available/expensive. Diageo states they use “the finest distilleries across Scotland and is aged in the finest whisky casks…from the powerful west coast malts all the way to the more subtle east coast flavors.” So we can expect a little of their Islay whiskies (Caol Ila or Lagavulin) or perhaps Talisker (from Skye) for some peatiness. Who knows what else, they sell at least 15 malts and I am sure some of their distilleries do not sell malt direct. While Red Label is said to be the best selling whisky worldwide, Black Label is no slouch: Diageo states JWB “currently outsells every other deluxe blended Scotch whisky around the globe.” They don’t define deluxe, of course. They aren’t comparing to Cutty Sark. Nor should they. With 43 whiskies of twelve year’s age in the mix, you get some decent results and sell a lot of product. But you know that Striding Man (see top of post)? Most folks who drink Scotch can name the brand when they see him stalking along in his natty frock coat. But he doesn’t come cheap, that guy. Developed in the early 1900s, the Striding Man has been slapped across countless billboards worldwide: he is in 200 countries, according to Mashable. That is a great article, and won’t even try to summarize it here besides saying the obvious: Diageo spends a lot of dough promoting the Striding Man. So, that opens the doors to smaller producers who, although selling fewer bottles, are spending next to nothing on promotion, comparably. As in the Sub-Jackson shootout, I thought to compare the mighty JWB to some worthy competitors. Two I’ve covered already, Monkey Shoulder and Black Bottle. And I’m throwing in a third contestant: Cardhu, a Speyside single malt which costs all of one dollar more than a (750 ml) bottle of Johnnie Walker at my local bottle shop. Mad, isn’t it? Diageo sells Cardhu. There may even be some Cardhu in JWB. Nose: Light peat, honey, peaches, sherry, shiraz; well rounded. Palate: fairly complex: peaches, vanilla, white pepper, earthy oak, touch of watermelon and a maritime air. Finish: Somewhat quick; honey, some oak tannins balance that, a bit peppery. Bottom Line: Damn hard to beat with any lesser cost tipple, single or blended. The go-to Scotch and a good value. 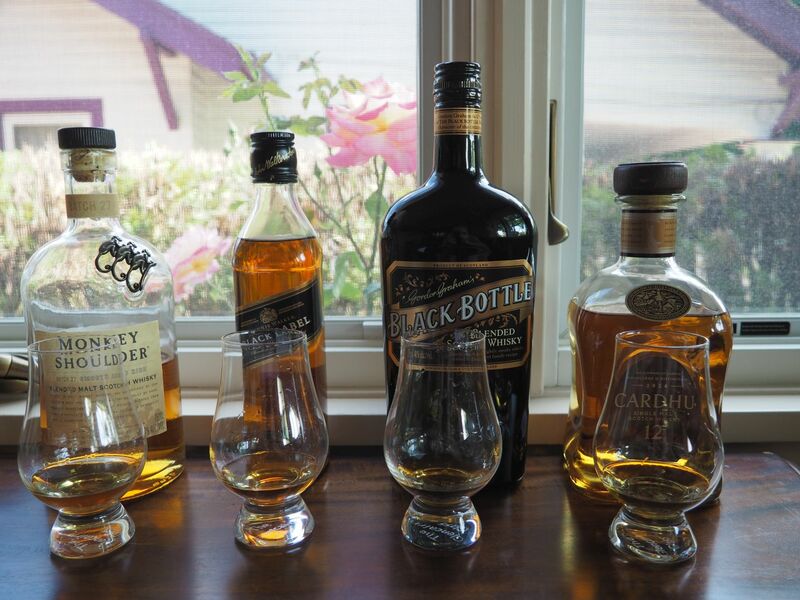 These are pretty good blends that come in well under $40 here in the rainy Northwest. Black Bottle, as noted here, comes across as young and brash. Exceedingly lively, like that 8-year-old kid across the street who is always shouting at the top of his lungs. I like the kid, and I like Black Bottle, but the balance is not there, the whiskies are just too young. And due to what some would say is harshness (well, it is, as I just re-confirmed), I would not serve it to guests who habitually wear Sperry Top-siders*. But it’s fine for the more adventurous and more experienced. But for the $$$…well, read on. Monkey Shoulder reviewed here. 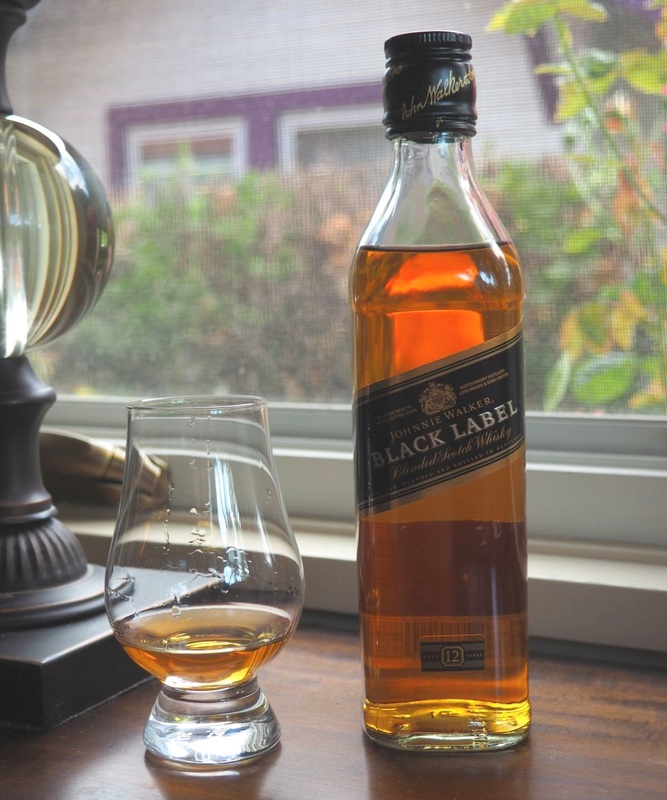 I stated “Johnny Walker Black has more character …due to its age and the touch of smoke it gets from its Islay component” and I found the Shoulder a bit mellow on the palate. On a re-review, there is a little rawness in the initial palate with MS and a bit of a grassy note on the finish which leaves an uneven experience overall. But at $8 less (about a 20% discount) than JWB, it’s a good budget pick and less likely to offend newer scotch drinkers than BB. Also it would make a great mixer as a step up from Johnnie’s Red Label. But the Black has nothing to fear here. So, two worthy, sub-Two-Jackson blends did not unseat the mighty JWB. But what about a budget single malt? Cardhu is not peated, it is a Speyside all through, and unlike some younger single malts (like Speyburn, an 8 y.o.) it is well-balanced. How does it fare? Finish: Malt, a little turkish delight, drying to some oaky tannins. Bottom line: Damn fine dram for $41. No peat or smoke, but in all-around complexity and finish, it makes the Striding Man’s coat look a bit faded and tatty. You won’t shake dedicated JWB drinkers, who have wedded themselves to the familiarity of the String Man’s frock coat and enjoy how well broken-in it is. Cardhu is a brighter, shiner, newer garment; it shimmers where the Black smolders. Against JWB’s mellowness it offers a wider range of fruit and liveliness, and a longer, more complex finish. A good single malt for those looking for some peat is Ardmore (www.ardmorewhisky.com but nothing there yet). There is a fair bit of smoke in that dram, and for a youngish (NAS but said to be 8 y.o.) whisky, really well done. More on that in a later post! This entry was posted in Scotch-blends, Whisky and tagged Black bottle, Johnny Walker, Monkey Shoulder, Scotch, Seymour Duncan, Topsiders, Whisky. Bookmark the permalink.